Used Soil Vapor and Dual Phase Extraction Systems | Enviro-Equipment, Inc.
Enviro-Equipment sells used soil vapor extraction and dual phase extraction remediation equipment. The list below is constantly updated, however we sometimes have items that may not be shown below. 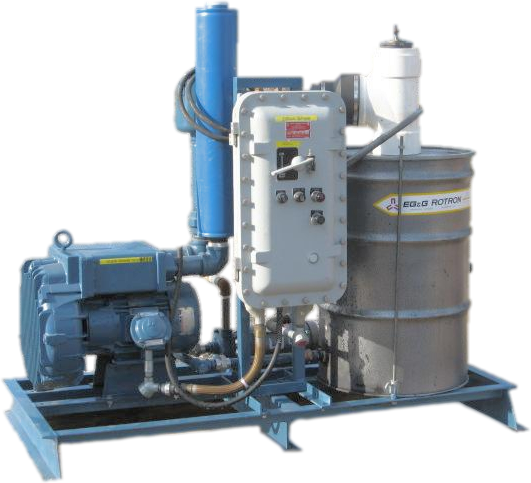 Our inventory of used soil vapor extraction and dual phase extraction units typically includes equipment from the following quality manufacturers: Atlantic Fluidics, Carbon Air, Dekker, Gast, Gardner Denver, Nash, Roots Dresser, Rotron, SoilVac, Sutorbilt, Travani and Tuthill. We also sell new Dekker, Rotron and Roots vapor extraction and dual phase extraction units. Lets us help you with your AFVR, MEME, MMPE, soil vapor extraction, and dual phase extraction needs. Win bids through Used Soil Vapor Extraction and Dual Phase Extraction Remediation Equipment by paying a fraction of the new price! Used Remediation Equipment can save you money without added risk of increased downtime. New Equipment combined with Used Equipment will still save you money and allow for more flexibility in Equipment selection. All Used Soil Vapor Extraction & Dual Phase Extraction Remediation Equipment Systems below are available for rent. For more information, visit our Soil Vapor Extraction Rental or Dual Phase Extraction Rental pages. If you need pricing or don't see what you need, please give us a call at (866) 655-8267 or Email Us with what equipment you are looking for and we will do our best to fill your order.